Alexander Calder initially trained as an engineer before attending painting courses at the Arts Students League in New York. He travelled to Paris in the 1920s where he developed his wire sculptures and by 1931 had invented the mobile, a term first coined by Marcel Duchamp to describe Calder’s motorised objects. The exhibition traces the evolution of his distinct vocabulary - from his initial years captivating the artistic bohemia of inter-war Paris, to his later life spent between the towns of Roxbury in Connecticut and Sachéin France. The exhibition will include a selection of his most significant motorised mobiles. 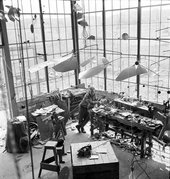 Black Frame 1934 and A Universe 1934 reveal the ways in which Calder made use of his training as an engineer and his fascination with the dynamism of the cosmos. By 1932, Calder’s suspended sculptures would begin to move without motors, animated by just the lightest of air currents. In Snow Flurry I 1948, Calder demonstrates his masterful expertise in constructing large-scale mobiles whose equilibrium and reduced palette awards them their sublime quality. Calder reinvented the possibilities of sculpture in parallel with avant-garde developments in theatre and dance. He incorporated elements of choreography and sound to fundamentally change the principles of traditional sculpture, creating mobiles which chime and resonate such as Red Gongs 1950, Streetcar 1951 and Triple Gong 1951. The exhibition will close with Calder’s large scale mobile Black Widow c.1948, shown for the first time ever outside Brazil,demonstrating how his art in motion turned global after WWII and came to serve as a visual metaphor for a new and free social order. Alexander Calder: Performing Sculpture is curated by Achim Borchardt-Hume, Director of Exhibitions, Ann Coxon, Curator, and Vassilis Oikonomopoulos, Assistant Curator and organised in close collaboration with the Calder Foundation. The exhibition will be accompanied by an illustrated catalogue presenting new research and by a programme of talks and events.